In the last thirty five years we’ve worked with just about every top performer that’s toured Australia, so we know how to meet very high expectations. No matter what type of show you’re running, we’ll design the best, most cost-effective sound system for it, then deliver it and operate it without a hitch. Our philosophy is Everything you need to succeed, no more no less and our aim is to satisfy everyone on the stage, behind the stage and most importantly, in front of the stage. 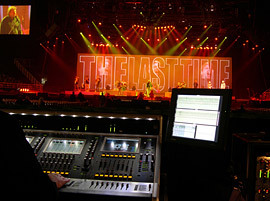 There are no second chances in live production: the PA is either working when the lights come up or it isn’t. At JPJ Audio we pride ourselves on our ability to put systems in on time and have everything working perfectly when it’s show time. If something breaks down in rehearsal, we’ll replace it right away at no extra cost, no time wasting, no stuff-ups. No matter where you are, or what you’re doing we’ll get your show out of the warehouse, into the venue and out again, safely and reliably.